Having arrived in Sydney, I’m staying with some of Lisa’s relatives who have kindly provided us with a room for a while until we get our own place sorted out. One of the things they have in their house, is a proper mechanical cuckoo clock, which I find highly amusing every time it pops open and emits chirps. I decided it would be fun to write a twitter cuckoo clock. It’s pretty simple code-wise, just need to generate a tweet every hour with a cuckoo for each hour on a 12-hour clock and a bit of general sanity checking, such as checking what time the last tweet was posted, so if crond goes nuts it won’t spam the feed. 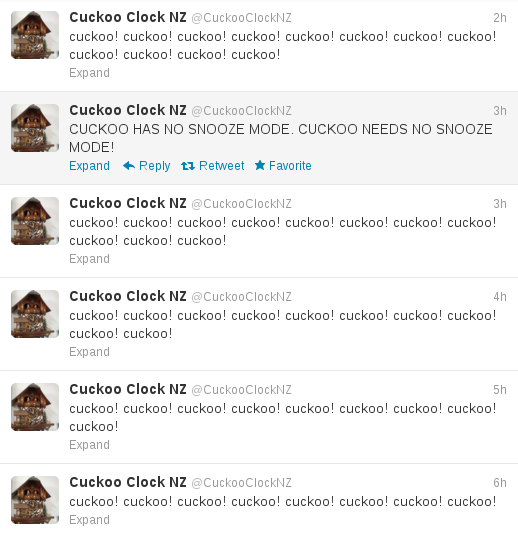 Behold, the amazingness of the Twitter cuckoo clock. I decided to make it slightly more interesting, so every time it tweets, there is a 1-in-10 chance of it posting some other message from a list of defined messages, as per the above example. Slowly getting more used to Python coding, I’m not a huge fan yet, there’s some nice things about it, like the enforced indenting structure, but some odd things that throw me after years of PHP and Perl, such as for loops and the stricter type handling that need getting used to. This entry was posted in Uncategorized and tagged bots, code, cuckoo clock, geek, python, twitter. Bookmark the permalink.